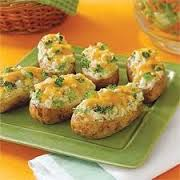 Prick potatoes with fork. Bake 1 hour. Cut thin slice from potato tops. Scoop out, leaving 1/8-inch-thick shells. Mash potatoes in medium bowl. Add dressing, sour cream, chives and mix. Spoon evenly into shells; top with Velveta. Thanks for Shopping at Glen Ellen Village Market!